The new Super Mario Galaxy 2 video game for the Nintendo Wii is one of the most sought after new games of 2010. With Yoshi following closely, Mario comes back to the Wii for even more planet-hopping fun and adventure. The game features all kinds of new power-ups to obtain along with new puzzles, collectibles and levels. While some stars may take longer to get than others, the game as a whole is one that gamers of all levels will enjoy. This is the sequel to Super Mario Galaxy, which was one the top games of 2007, and there is no reason to believe this new version will not have similar success. 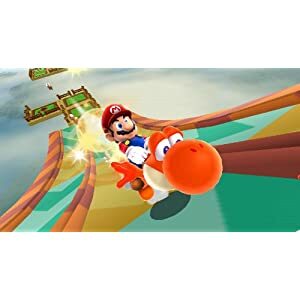 Once again Yoshi can be ridden by Mario after finding an egg on a level. Yoshi also has maintained the ability to grab items with his sticky tongue and spit them at enemies as well as use his tongue to reach new areas by swinging across chasms. Yoshi can also obtain special powers by consuming various foods, such as swelling up like a balloon so he can float by eating blimp fruits. There are new gadgets for Mario himself to use such as a drill that he can use to burrow his way from one side of a planet to another. Like the first Super Mario Galaxy game, each 3D planet has certain gravity challenges that must be overcome to maneuver through the level properly. This could mean gliding from place to place or having to complete the level by working in an upside down fashion. Super Mario Galaxy 2 also features a new asset called “comet metals”. By collecting these items the user can extend their gameplay by reaching new levels and challenges that will be more difficult than the rest of the game. This new title also features many shifts in tempo, dynamics, and perspective that many other games can only dream about incorporating. The great thing about this new Mario game is that you rarely need to complete the same task twice. This shift in gameplay is evident early on, as in one of the early levels Mario moves around the corner of a 360 degree playground and is thrust into a two dimensional maze in which he will follow the path of coins until a big door opens up behind him bringing him back into the three dimensional world. The transitions are so smooth that you will not even realize the transition is happening. While much of the game is similar to it’s predecessor, there are also instances in the game that will take you back to the early days of Mario as well. You will notice that some enemies, audio bits, and some mechanics of the game feature characteristics that have been included in all of the Mario versions that have been produced over the last thirty years. The map feature returns in Super Mario Galaxy 2, but it is some of the new features that makes this game one that many Super Mario lovers will appreciate. One of the most talked about features is the new Cloud Suit, which allows the conjuring of a limited range of platforms. While the difficulty of the game steps up upon reaching the fourth map, it is not something that will be so difficult that you won’t be able to conquer the task with repetition. This new Wii adventure also features the chance for Luigi to get in on the action. World One play features galaxies with a variety of terrains, while world 2 features new means of transportation. Level 3 includes a journey through some treacherous falls. Yoshi can also use his tongue skills for multiple targets, and the Fluffy Bluff gameplay features the Cloud Suit and an escape from the Cosmic Clones. In the Sky Station gameplay Mario will again take to the skies, and you will also get to use the famous Mario spin attack once again. Super Mario Galaxy 2 is a game that features characteristics of all the old Mario games plus a variety of new twists. For kids of all ages (and adult kids as well! ), Super Mario Galaxy 2 is a game that should be added to your Wii accessories and games collection as soon as possible. And now… the Super Mario Galaxy 2 Trailer!